Bio Notes: William ('Bill') Alexander McKimmie was born on 24 September 1940 in the Hilton area of Aberdeen, the son of William McKimmie, a bus conductor who served in Burma during the Second World War and who returned a virtual stranger to his son. Bill McKimmie was educated at Woodside Primary and Hilton Academy. He completed his schooling on a scholarship to the former Aberdeen Academy, in the city’s Schoolhill. He excelled in various sports while at school and planned to become a physical education teacher. However he changed his mind and studied for the diploma in architecture at the Scott Sutherland School of Architecture in Aberdeen from 1958 to 1964, graduating in the latter year. That same year he married Lesley, a fellow student in architecture. He was elected ARIBA in 1966. He had joined the practice of Jenkins & Marr in 1965 being promoted to partner in 1973 and becoming senior partner. Apart from a spell in Wick he remained in Aberdeen. As senior partner, he led his team in a number of large projects including the Bon Accord Centre, the Buchanan Galleries in Glasgow, the design of Aberdeen Journals’ building in the city’s Lang Stracht and the headquarters for Total and Chevron. McKimmie, who was formerly chairman of the Junior Chamber of Commerce, was also on the management board of Grampian Housing Association, chairman of Glencraft, a social enterprise whose staff includes employees with disabilities, and an avid supporter of Aberdeen’s independently-run Inchgarth Community Centre. He was well-known in Aberdeen and in Aviemore where he indulged his passion for skiing and built a second home there. He also skiied with his wife in Canada, the United States and Europe. He also travelled widely through his work, often spending time – through his connections with Total –in Villefranche on the French Riviera. 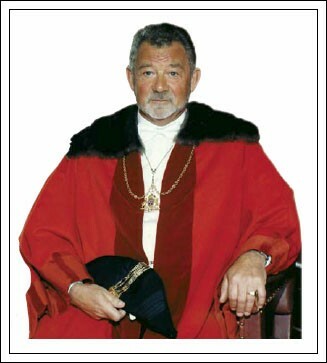 He served as Dean of Guild between 1998 and 2002, (and was appointed Lord President of the Court of Deans of the Guild of Scotland in 1999). He also served on the management board of the Grampian Housing Association and was chair of Glencraft, a social enterprise which endeavoured to employ staff with disabilities and was a supporter of Ingarth Community Centre. He was a keen Rotarian, and was President of the Rotary Club from 1995-6 and a Governor of Robert Gordon's University where he sat on numerous committees and, in 2007, cut the first sod to signal the start of building work on a £115 million development of its Garthdee campus. He retired from the practice in 2000. He died suddenly on 9 November 2014. His wife Lesley, who had given up her career to support his, had predeceased him but he is survived by his daughters and grandchildren.